Michael Gill Cellars on Peachy Canyon Road. A hunter, a dentist and winemaker walk into a bar, and the bartender pulls out just one glass. Why? Because, in this case, all three roles belong to the same man: Michael Gill, owner of the eponymous boutique winery, Michael Gill Cellars, who draws from his experience in each for his present mission: making award-winning wines. “We have a wine for just about every meal imaginable,” says Michael. With precision, instinct, patience and determination, Gill seems to have narrowed in on the perfect property, the ideal Rhone varietals, and best methods to craft wine unlike any other. There is no question he has a palate for the art – in his first year entering the Central Coast Wine Competition, he entered four wines and came home with four awards: he swept the Syrah competition, winning the impressive Best in Class and gold medal for his 2010 Tuxedo Syrah, along with a silver for his Big Rock Syrah and a bronze for his Black Tie Syrah. Additionally, he won a bronze for his Tantrum Tempranillo. “Personally, I think our Tempranillo is a gold medal,” says Michael’s wife, Shelley, with a laugh. “But they didn’t ask me.” Since then, Michael Gill Cellars wines have earned over 20 medals, including three Best of Class and Best of Show – all this in the family-owned winery’s first two years of operations. The list of prestigious competitions is impressive – Sonoma, Denver, San Diego, Pacific Rim, San Francisco, Orange County and, of course, Central Coast – all have confirmed what the Gills already knew – they make amazing wines. Shelley said they were encouraged by tasting room guests, many of whom were judges at wine competitions, to start entering their wines. 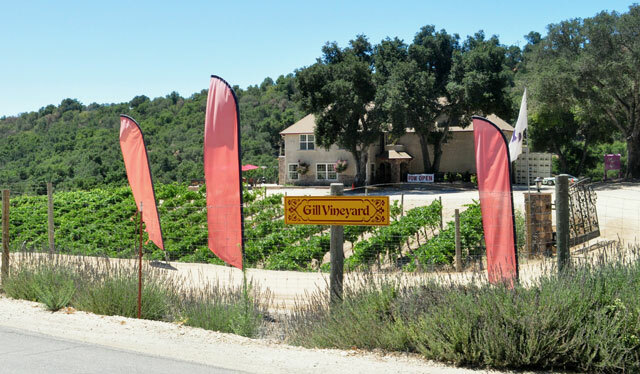 Unsure of what to expect, Shelley said she and Michael were “completely blown away.” The awards establish Michael Gill Cellars as one of the top boutique wineries in Paso Robles. Shelley, who runs the tasting room and helps her husband pour on the weekends, said the accolades have helped to put their winery on the map. “Many visitors to the area are now actively seeking us out,” she says. Producing just 1,000 cases annually and, being relatively new on the winemaking scene, their brand is currently enjoying a bit of the off-the-radar mystique. But guests who do make their way to the tasting room, tucked into the wild wine country of the west side on Peachy Canyon Road, need not fear finding an untamed facility in the early, awkward stages of developing its brand. Michael Gill Cellars’ property is as surprisingly mature, sophisticated and spectacular as their award-winning wines. Shelley explains that her husband has owned the property since the mid-1970s. “He credits our neighbor Robert Nadeau with planting Syrah,” she says, adding that Nadeau’s sage insight led Michael to plant the variety back in 1998. For ten years, Michael grew the grapes, sold the juice and let other people win the awards. “He began noticing that no matter who the winemaker was, his juice had a distinct nose and taste to it,” Shelley says. So, in 2008, he decided to put his own label on the wine, building a winery and introducing his first vintage in 2008. And considering the type of person Michael Gill is, it’s not really so surprising that just a few years later, he left the awards ceremony laden with medals. “He’s an amazing guy, a man of many talents,” Shelley says, without even a note of personal bias. She explains simply that when he does something, he does it well – he is a world-class, much-decorated hunter, and a practicing dentist with a degree from USC Dental School. The hunting theme is ever-present in the tasting room, which is adorned by a striking taxidermy display, while the dental influence can be seen more in the surgical care with which he inspects his vines, and blends his wines. “I like to say, ‘He was a hunter and then he became a gatherer,’” she laughs. Yet, when you taste one of the “big, big” Syrahs at Michael Gill Cellars, it’s clear that there is more than simple berry picking involved here. That he uses words like “raw,” “wild” and “chewy” to describe the deep and complex ruby-hued wines reminds you that Gill is not your average maker of wine. This is a hunter and a doctor of wine. “I tell everyone that I make the type of wine they can drink with a fork,” Michael says. “It pours as a debutante and finishes as the grande dame.” And whether you see him at his private practice in Bakersfield or at his winery in Paso, there’s one thing you can count on: your toothache will be cured. Meet the mystery man behind Michael Gill Cellars at his tasting room, located at 4125 Peachy Canyon Road in Paso Robles, Friday through Sunday from 11a.m. to 5 p.m. and by special appointment. For more information, call (805) 239-1668 or go to gillcellars.com.